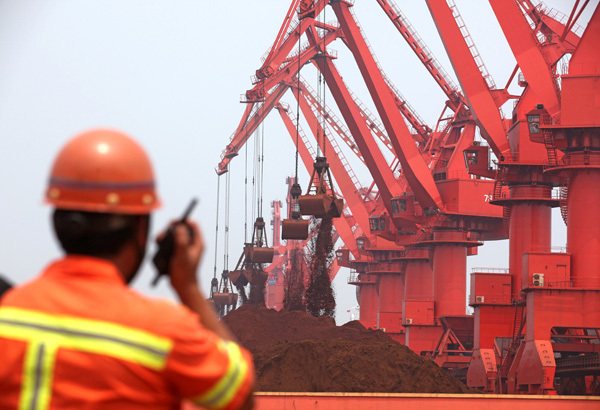 The jump in the Metal Bulletin's benchmark 62%-index was even more spectacular tracking gains of 5.9% at the ports of Qingdao-Rizhao-Lianyungang in China to $54.04 a tonne on Wednesday, a four week high. 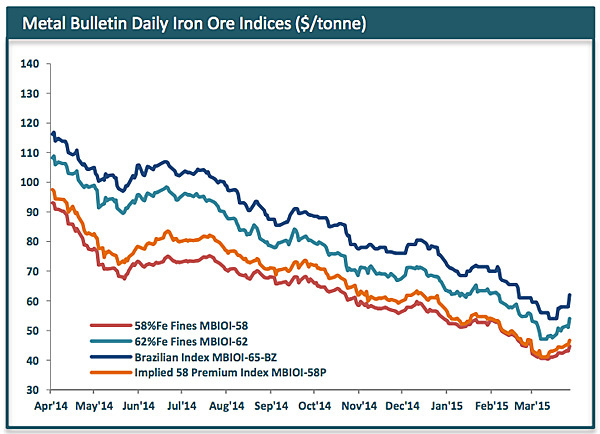 MetalBulletin's 65% Brazilian index soared $4.00 to a five-week high of $62 a tonne, nearly $7 higher than its record low. Vale is expected to ship 340 million tonnes this year, more than 20 million tonnes greater than last year. After lagging the expansion of Australian producers during the height of the boom, Vale is catching up fast with its longer term ambitions of over 400 million tonnes a year. The Rio de Janeiro-based firm's American Depository Receipts trading in New York surged on the news adding 8.8%. Vale's results came just a few hours after BHP Billiton , the world’s third-placed iron ore miner, announced it produced 59 million tonnes of iron ore in the three months through March, up nearly one-fifth on the same period a year earlier and 5% on the preceding quarter. On Wednesday BHP also announced its deferring its Port Hedland "debottlenecking" project. Not because it's paring down production growth – the Melbourne-based company explained that its already installed infrastructure "continues to exceed expectations" and putting on hold the project means it can slash costs further. BHP Billiton's longer term ambitions of 290 million tonnes within two years remains undiminished. BHP, which relies on iron ore for more than half its earnings, gained more than 3% in New York trading. Rio Tinto revealed Tuesday its output was below expectations, but nevertheless jumped 12% in the first quarter from a year earlier, to 74.7 million tonnes. Rio Tinto is on target to reach 330 million tonnes this year, 35 million tonnes more than 2014. The world's number two producer has a goal of 360 million tonnes per year by 2017. Rio Tinto shares added 3.8% on the NYSE, bringing its market value to just shy of $100 billion. Of the world's large diversified miners, Rio is most exposed to iron ore, relying on the raw material for more than 70% of income. The three majors have been able to push out marginal producers thanks to cost cutting and making the most of per unit volume savings. Rio Tinto has said its cash costs are now at $18 a tonne, BHP's on Wednesday announced it has managed to bring costs to below $20, a drop of 30% over the last six months while Vale is also closing in on the sub-$20 mark.